Jazz and her brother Peet joined our breeder and her adorable grandson for a pet therapy visit today. The puppies were very well behaved and the residents enjoyed seeing them. We're looking forward to visiting again soon! We once again had Tess at CPE agility this past weekend, where she earned her Level 2 Strategy Games title, completing all Level 2 titles for her CL-2 designation. Tess also had qualifying runs in Level 3 Jackpot, Wildcard, and Full House. Check out the composite photo above for a view of Tess as she takes a jump during a run a couple of weeks ago. Too cool! Tess had a great weekend at CPE Agility. She qualified in seven out of nine runs and earned her Level 2 Standard, Level 2 Handler Games, and Level 2 Fun Games titles. She now has an alphabet soup of initials after her name, but they all add up to only one thing for Tess....FUN!! Here's a video of one of Jazz's first attempts at agility. 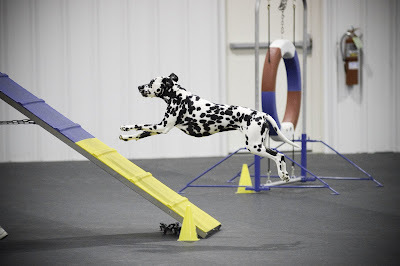 Because she is only 5-1/2 months old and the growth plates in her bones are not yet closed, Jazz is not allowed to do any of the contact obstacles and is limited to a few very low jumps, but that doesn't keep her from sharing her sister Tess' enthusiasm for the sport of agility! She was so proud of herself after she ran her little course of tunnels, and you can see how much she enjoyed it. Look out, Tess...Jazz may have just started her agility career! !